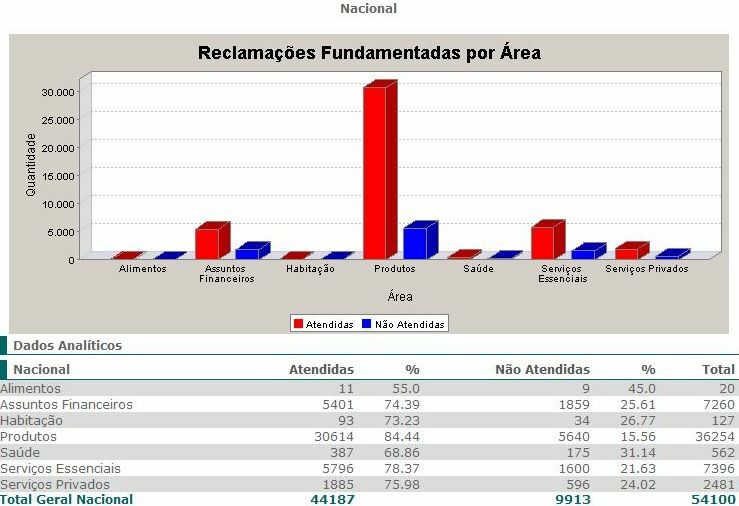 In September the 21 Brazilian state consumer agencies (known in Brazil as “Procons”) belonging to the National System of Consumer Defense Information (Sistema Nacional de Informações de Defesa do Consumidor – SINDEC) opened (mostly on the internet) their registries of consumer complaints, including their rankings of which firms were the subject of the greatest number of complaints. SINDEC is a network run by the Ministry of Justice’s Department of Consumer Protection and Defense (MJ-DPDC) to foster cooperation and joint efforts by the nation’s state and municipal consumer agencies. [Temas Note: To understand the complex Brazilian consumer protection regime, please consult the Temas page on consumer protection authorities in Latin America and the Caribbean (LAC).] 21 states (Acre, Alagoas, Amapá, Amazonas, Bahia, Ceará, Espírito Santo, Goiás, Maranhão, Minas Gerais, Mato Grosso, Mato Grosso do Sul, Pará, Paraíba, Pernambuco, Piauí, Rio de Janeiro, Rio Grande do Norte, Rio Grande do Sul, Santa Catarina, Tocantins) and the Federal District (DF) participate in SINDEC, while São Paulo and Roraima are preparing to join. SINDEC’s National Complaint Registry page aggregates the data from the Procons, but contrary to what the DPDC’s press release claims (see below), the data currently available on the SINDEC site only covers up to August 2007, not through August 2008. [Temas Note: The DPDC also provides the wrong web address for SINDEC in the release — use instead the one I have above.] The more recent data, however, can be found on most of the websites of the individual Procons. The data aggregated at the national level only shows total complaints, complaints resolved and those not resolved, by state and by broad categories (food, financial issues, housing, products, health, “essential services,” private services). As you can see from the data up to August 2007 (click on bar graph at right to enlarge), nationally the greatest number of complaints involve products, followed by essential services (water, power, etc.) and financial services. “Products” was also the category with the highest percentage of complaints resolved (84.44%), followed by essential services (78.37%) and private services (75.98%). Many of the state Procon websites (plus many municipal Procons in the states of Espírito Santo, Goiás, Mato Grosso, Minas Gerais, Rio de Janeiro and Santa Catarina) not only publish online more up-to-date data, but also lists of company names and the number of complaints lodged against them. Unfortunately, there is little comparability between these lists. Some states just provide a list of top ten objects of complaint, some list all but by category, some only put out an alphabetized list, and not all list how many complaints were lodged and how many were resolved. For example, Procon-PE just published a top 10 list for September 2008 by number of complaints filed, consisting of four banks and credit cards, four mobile phone companies, a power company and a sanitation company. Procon-ES published a top 20 list for September 2007-August 2008 with total complaints, those resolved and those not; its top ten involved three cell phone service firms, two cell phone manufacturers, three department stores and one supermarket. Procon-SC provided a 50-page alphabetized list for September 2007-August 2008. I think that publicizing the consumer complaints registry is a good idea — give businesses, consumers and policymakers a good idea of where the problems are and who is doing something to address them. It also hopefully will also make consumers more willing to come forward with their complaints and concerns. I believe what some states are doing by publicizing the names of the companies also is useful, since it should keep the named companies on their toes and hopefully encourage them to become more responsive to consumers. I would like to see SINDEC work to produce a national version of this, so that all Brazilians can see which product and service providers only have localized problems, versus which are demonstrating bad behavior nationwide. Vinte e um estados em todo o país divulgam nesta quinta-feira (11), seus cadastros estaduais de reclamações fundamentadas – que são o resultado dos processos abertos a partir de reclamações de consumidores nos Procons. Esses registros trarão o ranking das empresas com o maior número de reclamações registradas nos Procons, no período de setembro de 2007 a agosto de 2008. Este lançamento integrado e simultâneo só foi possível graças à implementação do Sistema Nacional de Informações de Defesa do Consumidor (Sindec), que é administrado nacionalmente pelo Departamento de Proteção e Defesa do Consumidor, órgão vinculado à Secretaria de Direito Econômico (SDE), do Ministério da Justiça, nestes estados. A divulgação de um cadastro vai ajudar o consumidor a saber quais fornecedores têm mais ou menos reclamações e de que forma a empresa age diante destas reclamações. O Sindec é um sistema informatizado que reúne em rede as bases de dados usadas pelos Procons em todo o País. 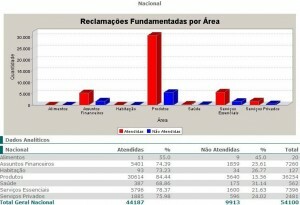 Diferentemente dos registros que já vinham sendo disponibilizados no sítio do DPDC (www.mj.gov.br/dpdc/sindec), o cadastro de reclamações fundamentadas traz as demandas em que os Procons já constataram que houve uma notícia procedente de lesão ou ameaça aos direitos dos consumidores, tendo sido elas resolvidas junto às empresas ou não.